Germany’s Black Forest region is home to many beautiful tourist attractions, and a well-known dessert—black forest cake. Based on the German dessert swarzwalder kirschtorte, it is a chocolate sponge cake with a decadent cherry filling. Typically it’s topped with whipped cream, chocolate shavings, and cherries. Usually there are seven layers of sponge cake, with whipped cream and cherry filling in between. 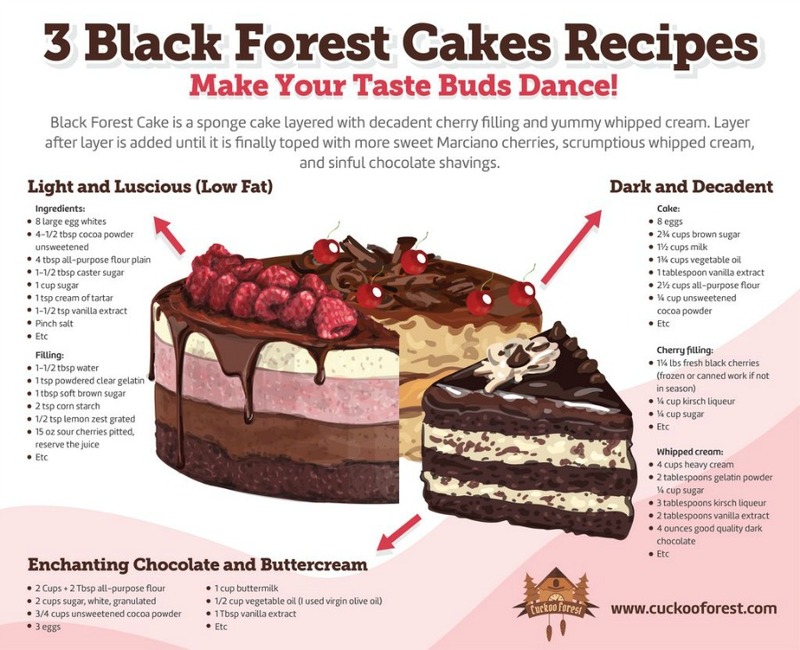 Cuckoo Forest – a premium online cuckoo clock shop would like to take the liberty and present you with not just one, but three delectable recipes for a homemade black forest cake. In American versions of the cake, regular cherries are often used. In Germany, they frequently use sour cherries, and sometimes even add kirschwasser, a clear spirit made from sour cherries. If kirschwasser isn’t available, sometimes other spirits, like rum, are substituted. In India, the cake is usually made without alcohol. In July of 2006, the K & U Bakery set a record for the world’s largest Black Forest cake, which tipped the scales at almost 3,000 kg, and measured about 80 meters. It contained 700 liters of cream, 5,600 eggs, 800 kg of cherries, and 120 liters of kirsch. That’s one thirsty cake! You can leave the kirschwasser (cherry liqueur) out or use a non-alcoholic version. Maraschino cherries or cherry pie filling can be substituted instead of fresh cherries. Many people prefer the taste of fresh or frozen cherries to maraschino, however. When making the whipped cream topping, keep all ingredients chilled, so the cream will whip up faster. This cake won’t keep very long due to the whipped cream, but good news—it won’t last long anyway once people taste how yummy it is! If for some reason it does last, it’s best to eat it within 1-2 days, and store in the fridge. Freezing is not recommended. If you like chocolate desserts, then you are going to love this recipe for Black Forest Cake! Ready to see how to make it? After preheating oven to 350F, grease two 8″ round baking pans and then dust them with cocoa powder. Line the pan bottoms with parchment. Place the dry ingredients into the bowl of a stand mixer, which should have a paddle attachment. Stir to combine. Use a medium bowl to whisk all wet ingredients. Go slowly with the hot water so you don’t overheat the eggs. Add wet ingredients to dry, then mix on medium for 2-3 mins. Expect batter to be very thin. Pour into prepared pans. You can evenly distribute the batter using a kitchen scale. Bake for 40 minutes, or until a cake tester comes out mostly clean. Cool 10 minutes in the pans, then remove the cakes and place them onto a wire rack to cool completely. Combine sugar and water in a small pot. Stir and bring to a boil. Simmer for about a minute before removing from heat. Stir in cherry liqueur and allow to cool completely. Whip cream and powdered sugar until stiff peaks. Use a chilled bowl with a cold whisk. Melt chocolate in 20 second bursts in the microwave. Take a large spatula and spread melted chocolate in a thin layer on a parchment sheet. Put one cake layer on a stand or serving plate. Brush generously with cherry syrup. Decorate with chocolate bark, chocolate shavings, and cherries if desired. If you want more of the Black Forest than just cake, it’s a beautiful place to visit, with many tourist attractions. Here is a list of 10 Must Dos in Black Forest Germany published by Cuckoo Forest.